"One way to preventing frizzle top is to test your soil prior to planting any new palm trees." Frizzle top is a disease caused by manganese deficiency most commonly occurring on Queen and Royal palms. At its earliest appearance, frizzle top will attack the young leaves as they emerge. Any new growth that does occur is limited to stubby petioles that do not grow terminal leaf tips.The disease causes yellow streaking and weak growth. Leaves on palms get necrotic streaking which affects all parts of the leaves except the base. Overall, the leaves will become yellow and tips fall off. The entire frond is eventually affected and will distort and curl. In some species the leaf tips fall off and leave the plant looking scorched. Frizzle top on palm trees will eventually cause the death of the tree if left unchecked. One way to preventing frizzle top is to test your soil prior to planting any new palm trees. This can help you gauge if there is adequate manganese in your soil. Alkaline soils are most likely to have low available levels of the nutrient. Creating a more acidic site by adding sulfur to the soil is a first step in preventing frizzle top. 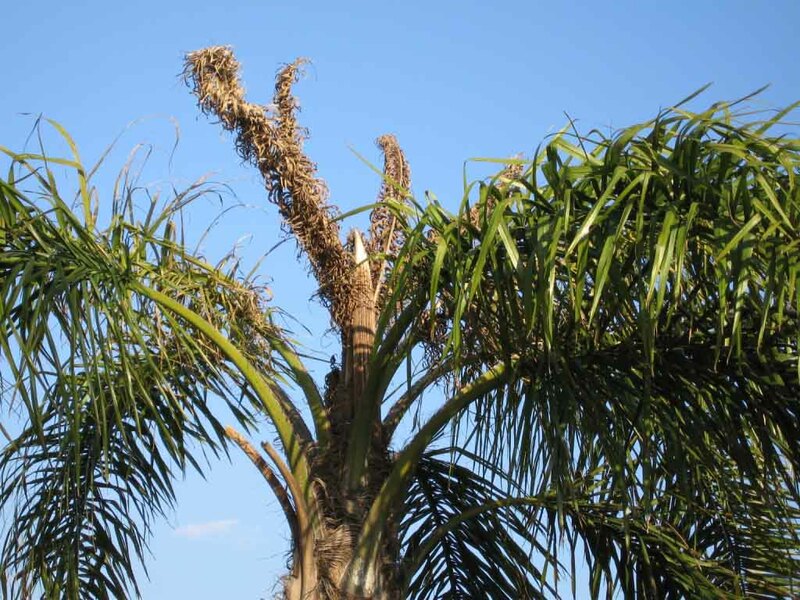 Frizzle Top TreatmentA consistent fertilizing program is the best way to minimize palm frizzle top symptoms. Use a water-soluble form of manganese fertilizer as a foliar drench. Apply it according to the instructions every three months. Average application rates are three pounds per 100 gallons of water. This short-term “cure” will help keep new emerging leaves green. A program of manganese rich soil fertilizer will help in the long term.Keep in mind that visual improvement will be slow. Fronds already damaged by palm frizzle top will not turn green again and need to be replaced by healthy foliage. This renewal could take several years, but if you are faithful to a manganese fertilizer schedule, the recovery will take place and ensure a healthy landscape tree.